Bang & Olufsen has done it again, rolling out yet another high end TV set for those who are feeling flush, never mind that most folks out there today are having financial troubles. Well, the BeoVision 10 might not come encrusted with diamonds as well as other kinds of luxurious finishing, but then again it commands a premium price over other standard HDTVs out there in the market. The BeoVision 10 LED product line has just gotten another addition with the introduction of a 32-inch version, where it will hit the market this November – which isn’t too far away, actually. The BeoVision 10-32 will come in a full HD LCD screen TV form factor, boasting an edge-type LED backlight, double sided anti-reflective coated contrast screen, five unique placement options and an active two-way loudspeaker system for optimal picture and sound performance. 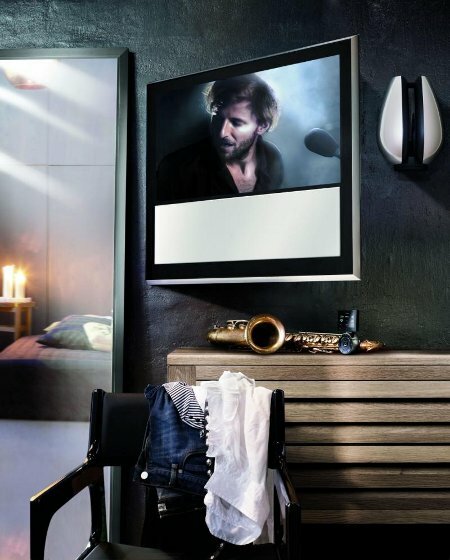 The BeoVision 10–32 not only looks good, it also signifies a new record for Bang & Olufsen since this is the first time the company rolled out a trio of models from a specific TV family within one year. The BeoVision 10 first hit the streets this spring with a 40-inch model, so having a smaller 32-inch model might just be the perfect balance for folks who think that the 40-inch model is too large (as well as too expensive). Boasting a similar chassis as that of the 40-inch and the 46-inch models, the BeoVision 10-32 will also adopt similar design principles, albeit on a smaller scale. Among them include a removable front fabric in a range of colors, (black, white, silver, dark grey, blue and orange) and an unique, high-gloss polished aluminium frame which delivers an optical illusion, making the TV look thinner than it actually is. The frame itself is split into front and rear sections, where the rear profile is curved for it to reflect the color of the wall for a look as though it is floating. Are you willing to fork out at least $4,707 for this puppy?